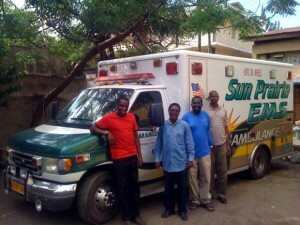 A former Sun Prairie ambulance was put into service in Arusha, Tanzania, after being shipped to the east African country by Hope 2 Others, a charity run by Meriter Hospital nurse Karen Klemp and her husband, Rick. Since making a plea for donations to help release a shipment of medical supplies stuck in an East African port, the nonprofit Hope 2 Others has ratcheted up its plans for delivering health care to a poor region of Tanzania. A State Journal story about Hope 2 Others in December 2011 prompted Madison’s Welton Enterprises Inc., to donate warehouse space for the group, founded in 2008 by Karen Klemp and her husband, Rick, after they met a group of musicians from Tanzania at church.